Anne Taintor is SOOOO hilarious!!! She just cracks me up so much! Her phrases on her merchandise just capture life's crazy moments. One reads, "had she really hit Reply to All?!?!?" I wonder if I'm Anne Taintor's biggest fan? Some of my friends on Facebook would probably agree that I am. I'm always referring to one of her sayings or another for different topics. I just blogged about being a mother and working full time over on skirt! if you want to check that out. It really is a miracle that I can work full time and take care of two children. 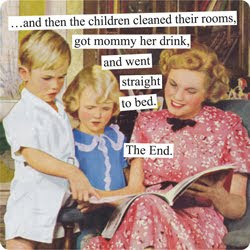 I so often think back to when I got married and I decided I wanted children. I was really blessed with a great baby. She was so good! But I always believed that I could not have only one child and I didn't want them years apart. I didn't want them too close together either, but not too far. I think three years was the perfect age difference. They play and they fight, like all siblings. Now that I'm the mother of two, I must admit that having two children is HARD!! Way harder than I imagined. Maybe if I was at home with them full time and I had them on set schedule I wouldn't feel this way. Maybe...But here I am and I have two extremely hilarious children. I know it's challenging but I also know that they are going to be awesome as long as I do my job of loving and nurturing them. I am so sick still! My voice is still a little hoarse and I need for it to clear up before tomorrow. If I do have to stand up in front of our ad division I'm going to sound more like Peppermint Patty than ever. I feel sorry for the kids. We've pretty much been holed up in the house all weekend and I was gone last week. I'm sure they enjoyed just having us home. Plus their cousins came over to play with them yesterday. Speaking of yesterday, I was so proud of the UH Cougars yesterday for their win over Texas Tech. That was a nail biting game! The weekend is almost over. Only a few hours left and it's back to the routine tomorrow. I hope I'm well enough this week to start walking again. I want to build up to running. I think the Fall-Spring is the best time to take up running. You all have a wonderful week until we meet again! Me on South Beach (Miami) in my Latina Lista t-shirt. Photo by Rey Ruiz. I've been seriously MIA for too many reasons to even start talking about. Cousin's reading, Open House for Kids' School on two different days, and so on... Then I had to get ready to go to Miami for work. Miami is so nice and the beach was beautiful! It felt like a vacation Saturday when we were at the beach. I was at the AHAA conference (Association of Hispanic Ad Agencies) Wednesday-Friday and then I stayed over the weekend for fun. Rey played while I worked and then we met up in the evenings for the events. Wednesday night we got there and they had a nice welcome reception with free drinks. We just had dinner at the hotel bar because we were tired. Thursday Rey ran around town and went down to South Beach while I was in the conference. We had a 5 p.m. reception and then a 9 p.m. one at a cool Rooftop Bar at a hotel down the street. Friday I was at the conference again and that evening we went out to South Beach and had a really good time. The place was amazing! And crazy!! The architecture of the hotels is just breath taking. Every hotel has a beautiful design. The women dancing on the streets is crazy!! They are just out there dancing in front of the bars to attract customers. How wild! Saturday was a little different. We went to the beach during the day, had lunch at an awesome place called Jerry's Deli. 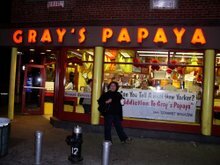 It reminded us of a really good New York deli. That night we went back to South Beach and that time we went out to a place called Lincoln Mall that reminded me of Europe. It has a big open plaza area from one street to another with stores, restaurants and clubs on each side. We really didn't do anything on Sunday because we were coming home. It was a short but nice trip. Traveling without the children is always a mixture of guilt and happiness. On one hand yes, I feel happy to be away and to be able to have adult conversations with my husband. On the other hand I feel a little guilty that I'm enjoying a really cool city without them. It's a weird mix. But in the end I know that I'm a happier mom because I did have this time away from them and that I get to recharge my batteries. I was very inspired by this conference in a creative way. There was one really amazing speaker, Don Wieden of Wieden + Kennedy, the ad agency for Nike and all those great quotes I LOVE. Funny, because I so admire the Nike campaigns. He was really an inspiring guy. One thing I was really motivated to do this trip was to finish a song that Rey and I started a while back. Well really Rey, but I helped along. It's such a great song and it deserves to be finished. So that's my goal this week. Photo by Marsha Miller from Oscar's official website. 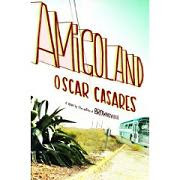 Only three days from now my cousin Oscar Casares will be reading from his novel, Amigoland, at his sister's (and my cousin too) restaurant, Sylvia's Enchilada Kitchen. 6401 Woodway Dr, near Voss. 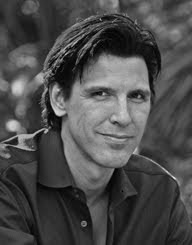 He's reading Tuesday at 7:30 p.m. but Sylvia will be serving a $12 buffet starting at 6:30 p.m. The bar will be open too. I've written several times about Oscar and about his book. His book has been very personal to me, because I recognized the characters in his book, even if the average reader didn't. His two characters are so familiar and the book made me so happy and so sad at the same time. The two main characters are older men. And their personalities are so much a mix of Oscar's dad, my dad and our Uncle Hector. To make things even more exciting... There are rumors flying about what will be Oprah's newest book club choice. On the list of possible suspects is no other than Amigoland! If Oscar's book is chosen this will be an amazing success story for him and for our family name. I hope that if you're in Houston you can come by and hear him. I will be there too and I would love to see as many people as possible there. So spread the word!! 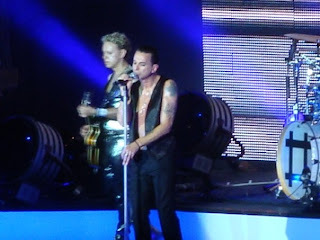 Last time I went to see Depeche Mode the Summit had just become the Compaq Center. They put on a great concert then. I don't know if it's that I'm older and I appreciate a good concert more now or if it's that I don't remember the last concert as well. The concert was so totally amazing! I read a great review on The Houston Chronicle's newest entertainment blog, Peep. It was written by no other than Joey Guerra. Read it and get chills. On to other news. Read my skirt blog and the chron.com Peep blog (once again the Peep) about my cousin Oscar's upcoming reading at my other cousin's restaurant, Sylvia's Enchilada Kitchen. He will be reading from his novel, Amigoland. As you can tell, I'm up and running again. Kids started school last week and I started work full time. I've been exhausted every day. My son started Kindergarten and he has brought home homework every day since school started. Well, they actually send a pack of five worksheets for him to work each day. I'm online and blogging way too late as usual so I will say good night now. I need to go make school lunch for tomorrow.